Formulated with all-natural ingredients, JASON Aloe Vera 84% Conditioner delivers long-lasting moisture to your hair, reducing the formation of split ends whilst increasing volume and manageability. Hair is left healthy, shiny and bouncy. 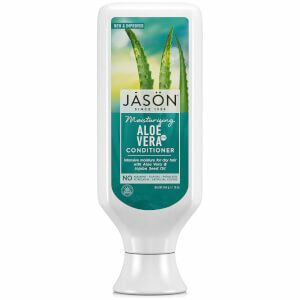 Gentle enough for daily use, JASON Aloe Vera 84% Conditioner nourishes your hair with minerals and vitamins A, C and E whilst it strengthens with spirulina, proteins and amino acids. Leaving your hair soft, silky and manageable, this unique conditioner offers plant derived vitamin B5 to thoroughly penetrate the hair shaft and root to leave your hair beautifully shiny and healthy. Massage conditioner into hair and scalp. Leave on for at least one minute. For best results use in conjunction with JASON Aloe Vera 84% Shampoo.